Become an ace bounty hunter as you take down motorized terror gangs in a high-speed battle for survival! 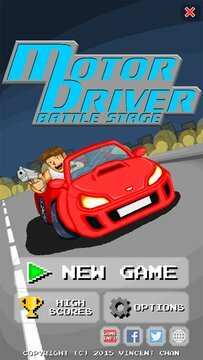 Set against authentic retro-styled pixel art graphics, you will have to master driving skills while crushing your enemies with a variety of unlockable and upgradeable weapons. * Endless arcade-style overhead vertical scrolling gameplay. * A choice of control schemes ('Modern' accelerometer or 'Classic' on-screen controls) to suit how you play. * Upgrade and unlock new weapons. 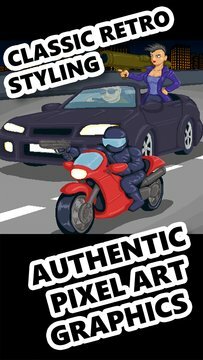 * Hand-drawn pixel art graphics. * Retro-styled CRT scan line effect (can be toggled on/off in the Options menu).